Star Wars means a great many things to all of us. To the late (and dearly missed) Carrie Fisher, “It’s about family, and that’s what’s so powerful about it.” And I, for one, couldn’t agree more with her sentiment. Indeed it is about family and very powerfully relatable too. To be quite blunt, a dysfunctional one, but a family nonetheless. Heck, who can’t identify with that? At least on some level or to some degree, we have all had some experiences in which we can relate to the Skywalker family. In fact, I think it’s safe to say that those so-called experiences make a family closer. Stronger. Hence the saying, “What doesn’t kill you makes you stronger.” And where the Skywalker twins are concerned, I’d say this ideal holds true. To be honest, I’d even go as far to say that we see this carry out into the very end of Star Wars: The Last Jedi with the Skywalker twin reunion. Now truth be told, I am a huge fan of the Skywalker twins. That said, their reunion scene on Crait was not at all what I had thought it would be. Headcanon can be a tricky thing for a Star Wars fan. It does weird things to one’s mind. But, I digress. And so, that moment where Luke saunters out from the shadows to come to his sister’s aid one last time, I became completely mesmerized by their connection. My so-called headcanon became Bantha fodder. Meaningless. It no longer mattered. What I had hoped for didn’t happen. But that’s ok. Turns out that’s not what I needed. Dovetailing back a bit, we see small hints of their familial bond sprinkled throughout the entire film. From Rey’s initial explanation of why she is there to the emotional reunion between Luke and his most loyal companion, Artoo. Leia is there. Always. And Artoo’s so-called “cheap move” is the nudge Luke needs. After all, Leia has always been Luke’s call to action. The holo recording of Leia is what snapped Luke to answer her call to action in A New Hope. And now, some thirty years later he’s once again drawn to her powerful belief that hope can still survive in even the direst of times. Hope. Skywalkers. The two seem to go hand-in-hand. Kind of like a Kyber crystal and a lightsaber. Or, as Lor San Tekka once said, “without the Jedi, there can be no balance in the Force.” Well, I guess that’s how I see the connection between the Skywalker twins. In more ways than one, they are two halves of the same thing. Like Luke says to Rey, “powerful light, powerful darkness.” Problems arise when an imbalance exists between those halves. Oh, that mighty Skywalker blood! Indeed, mighty it is. We’re very much aware of this factoid. In the novel adaptation of Revenge of the Sith, Yoda mentions how powerful the Skywalker line is in the Force. He instructs Kenobi to wait for the Force to tell them when it is time to train the twins and that together, powerful they will be. Luke confirms this in Return of the Jedi. He reveals to Leia her true identity and her place in all of this. She’s his twin sister and Darth Vader’s daughter. Together, they are the only hope. And together they must find a way to keep the balance. then, her candle of hope catches fire one last time. Luke saunters out from the shadows and sits down with Leia. They are face-to-face. No longer alone. It’s quite the rollercoaster of emotions. The interaction between Luke and Leia might be iconic, but it’s real and genuine too. You can’t deny the chemistry between Mark Hamill and Carrie Fisher. It’s electric! It’s surreal. 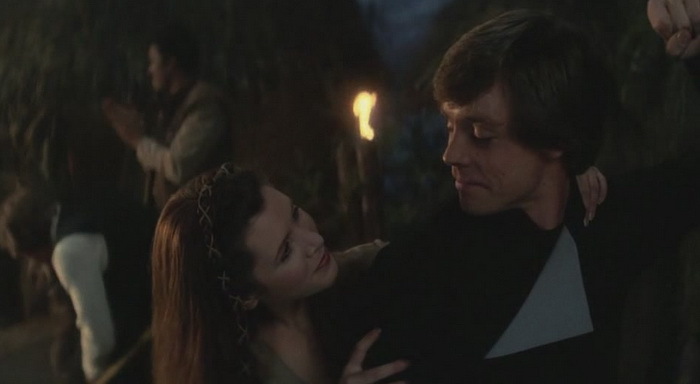 I mean, come on, just hearing Leia tell Luke, “I’m just glad you’re here, at the end.” Talk about life imitating art. Well done Becca! I agree, the connection between Mark and Carrie, cane through on the screw in their final face-to-face interaction on Crait. Even though Luke wasn’t “physically” their. You could still feel that deep emotional connection! Love the blog! The bond between the Skywalker twins always has been phenomenal, at least in my eyes. From “The Empire Strikes Back” when Luke’s and Leia’s connection makes it possible for Lando to fly the Millennium Falcon back to Cloud City to rescue Luke from his rather precarious perch to “Return of the Jedi” when Leia knows that Luke was not on the Death Star when it blew to “The Last Jedi” when Luke finally opens himself up to the Force, and connects with the ailing Leia. There is nothing that can truly separate them. Thanks for sharing your thought about the Skywalkers, specifically the Skywalker twins, Becca. Great job!